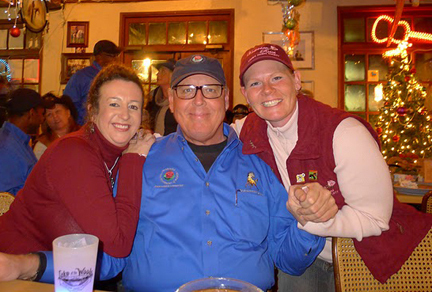 The Rose Parade week was a whirlwind! 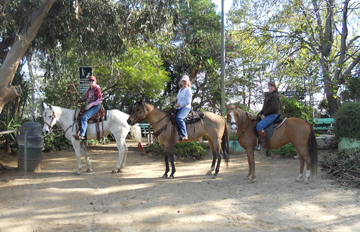 We call it a "week" because we were in LA for pretty close to 7 days with our horses. 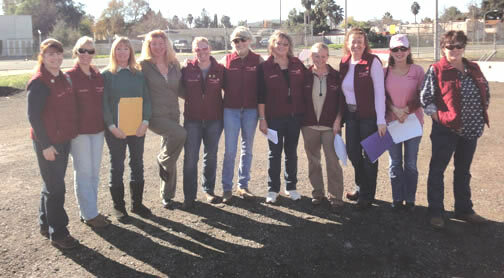 The LA Equestrian Center in Burbank was our homebase. 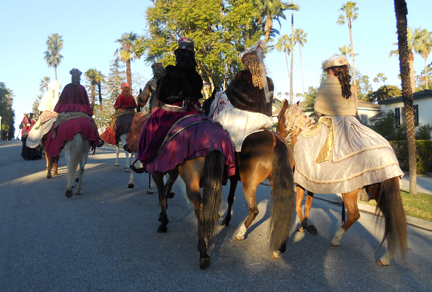 We drove up from San Diego in a long caravan of trucks, trailers, rigs and support vehicles a day and a half before Equestfest, an arena performance in the LA Equidome. Here we are in San Diego and ready to go! We settled the horses into their temporary home and set up our camp on the Equestrian Center grounds. 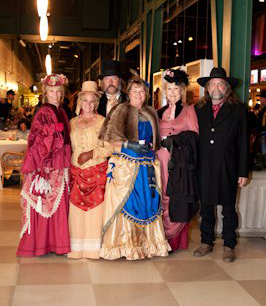 We got a chance to practice our routine in the arena then we rushed to bathe our horses and get dressed up for an Equestrian Reception hosted by Wells Fargo. It's always a glamourous night with food, dancing & socializing. This year we decided to go in style. The next day was Equestfest. We woke up to a couple of inches of fresh mud and it poured most of the day. We declined wearing our dresses in fear we would be dragging them through the mud and they would be ruined for the Rose Parade. 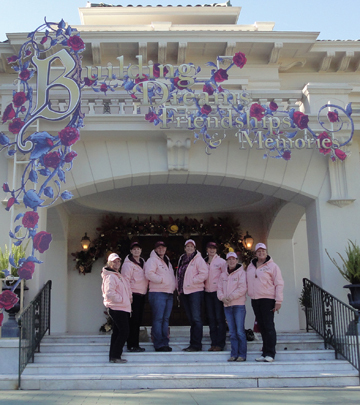 But the show must go on so we wore our matching pink club jackets instead. After a much-anticipated meet and greet with the public, we were off to our own anniversary party at a local restaurant. 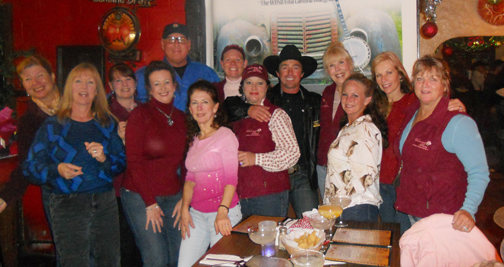 There we met up with fellow Rose Parade participants and committee members as well as handed out awards & gifts. 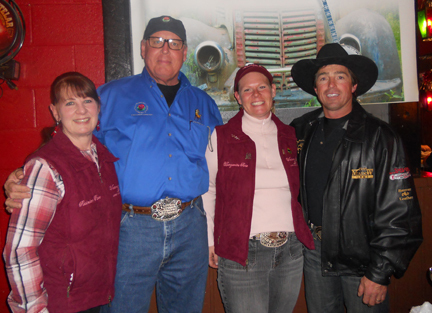 Here we are with Jon Montgomery, Equestrian President and Tommie Turvey, horse extremist. 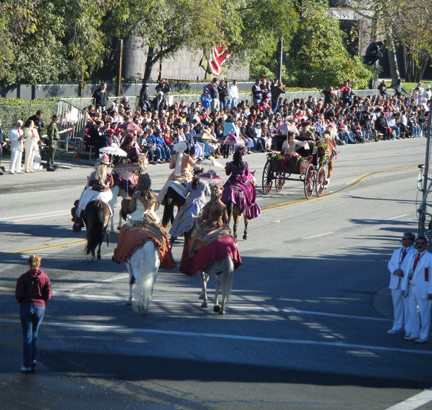 The next day was a free day for us so we are able to experience the Rose Parade a little. 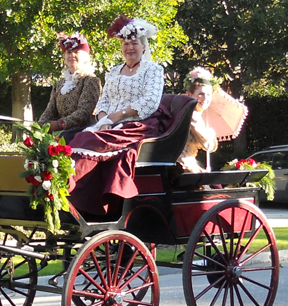 We got to ride our horses in Griffith Park, see the floats being created, visit the Tournament of Roses headquarters and shop for souvenirs. After that, we had an appearance with Road Scholars a travel company. We dressed up again and gave a slide show presentation and fashion show. 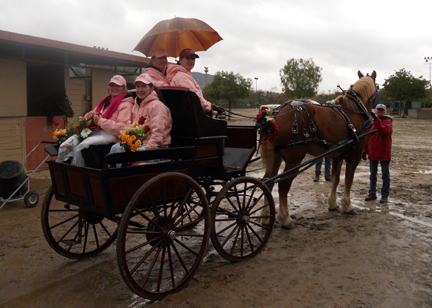 Before we knew it, we were bathing horses again and getting ready to move our camp into the staging area for the parade. We slept on a closed section of the freeway and woke up at 4 am to start getting ready. It takes us over an hour just to get dressed. 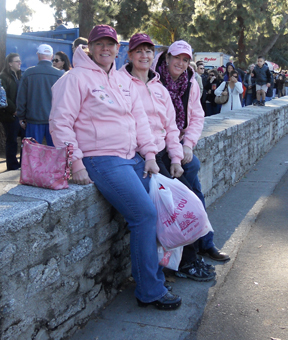 Our Rose Parade experience went way too fast. Before we could take a breath we were packing up and heading home. 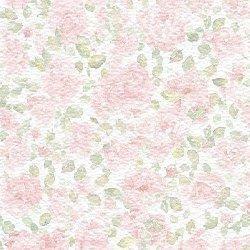 We can't wait to apply again and are already planning next year's dresses. To enjoy more photos of this wonderful experience, visit our Facebook page.